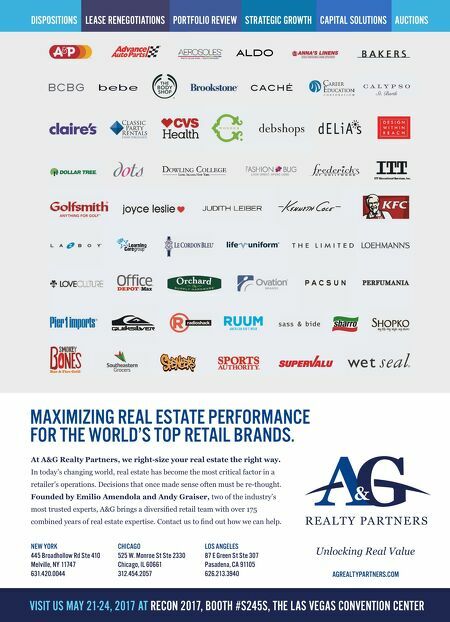 Unlocking Real Value At A&G Realty Partners, we right-size your real estate the right way. 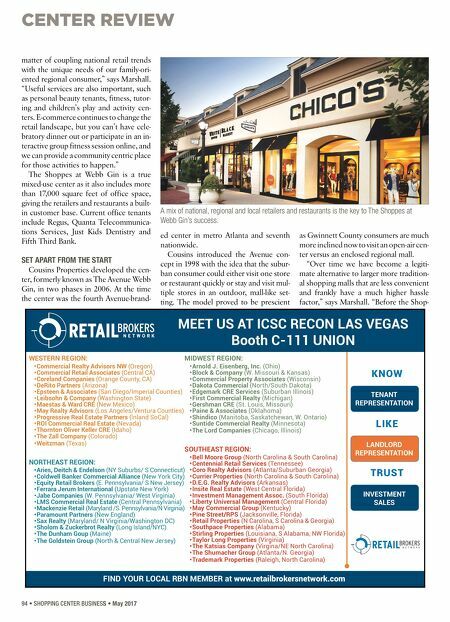 In today's changing world, real estate has become the most critical factor in a retailer's operations. Decisions that once made sense often must be re-thought. Founded by Emilio Amendola and Andy Graiser, two of the industry's most trusted experts, A&G brings a diversifi ed retail team with over 175 combined years of real estate expertise. Contact us to fi nd out how we can help. VISIT US MAY 21-24, 2017 AT RECON 2017, BOOTH #S245S, THE LAS VEGAS CONVENTION CENTER NEW YORK 445 Broadhollow Rd Ste 410 Melville, NY 11747 631.420.0044 CHICAGO 525 W. Monroe St Ste 2330 Chicago, IL 60661 312.454.2057 LOS ANGELES 87 E Green St Ste 307 Pasadena, CA 91105 626.213.3940 AGREALTYPARTNERS.COM DISPOSITIONS LEASE RENEGOTIATIONS PORTFOLIO REVIEW STRATEGIC GROWTH CAPITAL SOLUTIONS AUCTIONS MAXIMIZING REAL ESTATE PERFORMANCE FOR THE WORLD'S TOP RETAIL BRANDS.